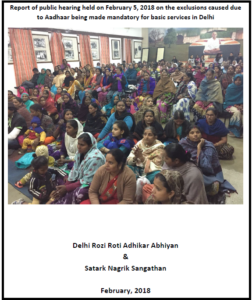 The Delhi Rozi Roti Adhikar Abhiyan (DRRAA) and Satark Nagrik Sangathan organised a public hearing on the exclusions caused due to Aadhaar being made mandatory to access rations under the National Food Security Act (NFSA) in Delhi on Feb. 5, 2018. 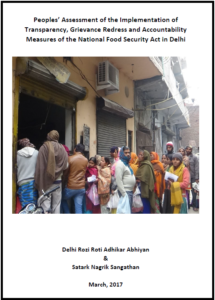 Hundreds of people from different districts and marginalised communities in Delhi participated in the public hearing and testified about their inability to access their legal entitlements of rations since the introduction of Aadhaar. Read the press release of the public hearing. Read the full report of the public hearing.